The biggest deal of the off-season was not Cristiano Ronaldo’s exit from Old Trafford and arrival in Spain or even Kaka’s departure from Serie A and arrival in the same destination. The biggest move of the off-season was definitely Zlatan Ibrahimovic for Samuel Eto’o. Why? Because it saw the change of two different stars lives rather then one. And we all knew that it would only be a matter of time until one of the two parties involved in the deal would open up a bit on what went down last summer to exchange two of the world’s greatest forwards. And Barcelona probably told everyone a little bit more then Inter would like. Apparently Inter had their eye on a young star in Barcelona, but the original demand was not for Samuel Eto’o. 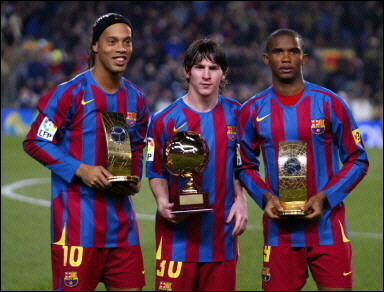 Like all trade negotiations Inter had their hopes set on Barcelona’s best and brightest young player, Lionel Messi. But Barcelona, as they have stated several times, would not even pretend that Messi was for sale and eventually the deal was worked out for Samuel Eto’o instead. I suppose such a revelation should not be too surprising. In this day and age owners want their teams to acquire the very best in the world and rarely settle for second best. Now when it comes to Messi that is simply the way it is going to be over the next seven or eight years. With a 250 million buyout Messi will remain a Barca player likely for the rest of his career. But still no word on how Samuel Eto’o feels about the supposed original offer.